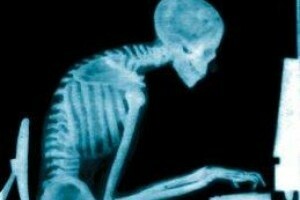 Sitting at a desk or computer all day will do very bad things to your spine, as well as shortening the muscles along the front of your body. What’s the problem with muscles shortening? Well, the tight chest/shoulders and hip flexors continually pull your back out of alignment, which creates sitting-like back pain even when you’re on your feet. You can make this exercise easier by placing your feet flat on a higher surface (like a box or step) and/or have a partner stand by your hands to pull your shoulders on the press up. As you build more confidence, you can walk lower and lower. This push up variation demands shoulder flexibility, core/glute strength, and body awareness. Give this exercise a try after a thorough warm-up and see how great your shoulders and back feel!